TORONTO – The Ontario Real Estate Association (OREA) has announced that Orillia-based real estate broker, Mike Stahls, has been elected as Provincial Director of OREA. The announcement follows the association’s annual conference on Feb. 27-Mar. 1 in Toronto. In this capacity, Stahls will serve a two-year term as Provincial Director for the Northeastern Ontario Area on the 2018 OREA Board of Directors. The Northeastern Area consists of the Bancroft, Barrie, Kawartha Lakes, Muskoka Haliburton Orillia – The Lakelands, Northumberland Hills, Parry Sound, Peterborough and the Kawarthas, Quinte and Southern Georgian Bay real estate boards. “Real estate is changing. OREA is committed to protecting the dream of home ownership for future generations and making sure our members are equipped for the modern real estate marketplace,” Mr. Stahls. Active in the real estate profession for 14 years, Mr. Stahls is a Broker for Royal Lepage Real Quest Realty Brokerage in Orillia. Mr. Stahls is a member of the Lakelands Association of REALTORS President from 2013 and 2017 and Director from 2014-2016. He served as President-Elect and Director of the Orillia & District Real Estate Board from 2010 to 2012. He has also served as a member and chair of the Lakelands Executive committee and OREA’s Marketing/Communications and Government Relations committee. The Ontario Real Estate Association represents 70,000 brokers and salespeople who are members of the 38 real estate boards throughout the province. OREA serves its members through a wide variety of professional publications, educational programs, advocacy and other services. A Muskoka real estate agent is the new voice for 70,000 brokers across Ontario. David Reid was named as the new President of the Ontario Real Estate Association during OREA’s annual conference this week. In the role, Reid will represent the OREA members on the Board of Directors and the senior level Executive Committee. He says serving as President is also an opportunity to advocate the government and support the value of realtors to the public when buying or selling a home. He says OREA aims to protect the dream of home-ownership for future generations and make sure potential homeowners are ready for the modern real estate market. Reid has been in the real estate industry since 2003, and is a former President of the Lakelands Association of REALTORS®. He has also served on various other committees. Reid says Lakelands, OREA and the Canadian Real Estate Association all work together in the industry. When it comes to the Muskoka market, Reid says 2017 was a good year for sellers, with a lot of multiple-offer situations. Reid says some of the OREA members will be in Huntsville this summer for a directors meeting. More about the organization and its political advocacy are on the OREA website. Ontario – The Lakeland Association of REALTORS® recently made a large contribution to Habitat for Humanity Ontario Gateway North, one that will impact the lives of families in both Orillia and South Almaguin. 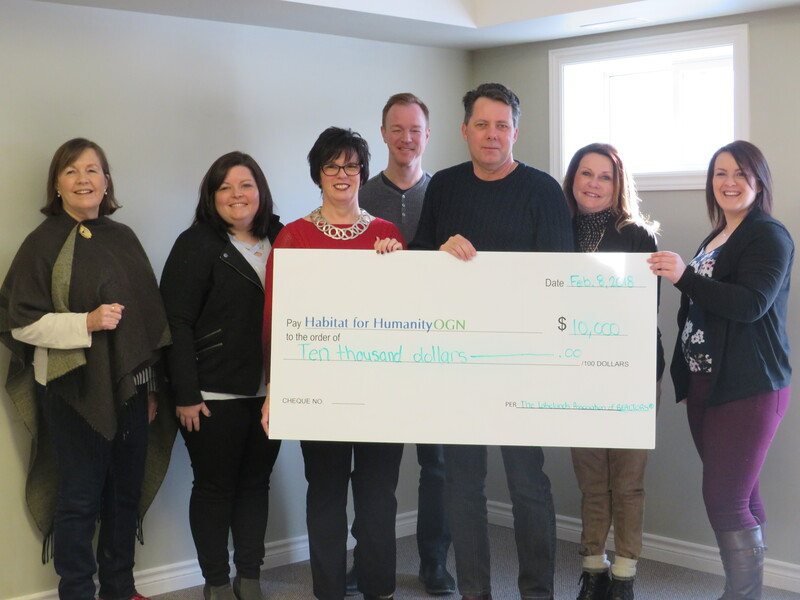 On Thursday, January 8, 2018 the local membership driven, professional real estate association contributed $10,000 to Habitat for Humanity OGN, funds that will go toward two local housing projects. As the official kick-off to the South Almaguin Adopt-a-Home project, Habitat for Humanity Ontario Gateway North broke ground in Emsdale last spring. The build site is located at Station Road, and Habitat will be announcing their partnership with a local family in the coming weeks. The Lakelands generous contribution will go toward the Station Road build in addition to supporting another Habitat build currently underway in Orillia. The Orillia housing project, located at 499 Bay St., consists of a semi-detached home that, upon completion, will house two local families. The Lakelands Association of REALTORS® is a professional organization committed to serving its 800 REALTOR® members with the tools, advocacy and professional development opportunities required to promote excellence, knowledge and a high standard of ethics and business practices. Its members provide real estate services representing different land use properties ranging from recreational, residential and commercial throughout the major geographical areas within the regions of the District of Parry Sound, District Municipality of Muskoka, Haliburton County and Northern Simcoe County including the City of Orillia. REALTORS® are champions of homeownership and are committed to improving Quality of Life by supporting policies that help ensure economic vitality, provide housing opportunities, preserve the environment, protect property owners and build better communities with good schools and safe neighbourhoods. Habitat for Humanity Ontario Gateway North is a not-for-profit organization that brings communities together to help families build strength, stability and independence through affordable homeownership. Find out more about the organization by visiting www.habitatgatewaynorth.com. As of 2018, The Lakelands gained new members from the Parry Sound and Area Association of REALTORS® increasing its membership to over 770 and moving jurisdictional boundaries now including the District of Parry Sound. Although talks began last fall between Associations after Executive Officer, Meg Cameron-Hammel announced her early retirement, the decision to dissolve Parry Sound and its membership joining The Lakelands was not made hastily. Following approval from the respective Board of Directors and membership, The Lakelands eagerly went to work onboarding its new members. This opportunity also presented the time rebrand the Association with a new logo. The Lakelands carefully considered each district in the new logo creation, the waves in the new logo represent unity to strengthen our vast regions. The Association worked with a local marketing agency Well Known company, for its redesign. The Lakelands Association of REALTORS® is a professional organization committed to serving its 770+ REALTOR® members with the tools, advocacy and professional development opportunities required to promote excellence, knowledge and a high standard of ethics and business practices. Our members provide real estate services representing different land use properties ranging from recreational, residential and commercial throughout the major geographical areas within the regions of the District of Parry Sound, District Municipality of Muskoka, Haliburton County and Northern Simcoe County including the City of Orillia. Muskoka – The Lakelands members will visit six local charities to donate over seventeen thousand dollars across Muskoka, Orillia, and Haliburton this holiday season. Five cheques of $3,264 will be presented to each organization, and a sixth cheque of $1,280 is donated to Cottage Dreams annually. Those eligible to receive a grant must be a community shelter-based charity, operating in our region and meet all application criteria—submitted to the Association by the first of September. The Sharing Place Food Bank, Orillia: provides nutritious food for three to five days once a month. Muskoka Interval House, Bracebridge: provides shelter and resources for women and children. Huntsville Hospice, Huntsville: provides care and support to individuals in the Huntsville area who are facing end of life situations. Cottage Dreams, Haliburton: provides rental cottages for families to enjoy following cancer treatment. Alzheimer Society of Peterborough, Kawartha Lakes, Northumberland and Haliburton: dedicated to improving the quality of life for those living with Alzheimer’s disease and other dementias and advancing the search for the cause and cure. Burk’s Falls & District Food Bank: covering seven districts it provides food and resources for those in need. Local Realtors are committed to improving Quality of Life by supporting community initiatives ensuring economic vitality, housing opportunities and safe neighbourhoods. The contributions by Lakelands members through the Ontario REALTORS Care® Foundation are important to the communities we live in as they boost the ability for these organizations to support residents. The Sharing Place is a non-profit organization that provides food, food education and food policy work for our community. We work collaboratively with partners to help remove the barriers to accessing nutritious, affordable food. Our services range from school breakfast and snack programs, community cooking classes, gardening programs to providing a five-day emergency supply of food to those in need. In 2017 The Sharing Place served or taught over 17,000 children and adults while developing food policy and school programs for future generations. Produced by CREATIVE ONE® | All contents copyright © 2019 The Lakelands.